A fire believed to have been started deliberately has swept through a Moscow drug rehabilitation clinic, killing 45 women. Many of the victims were trapped by metal bars on the windows when the blaze broke out on the second floor of the eight-storey building, the emergency ministry said Saturday. "All 45 died before firefighters arrived," Deputy Emergency Minister Alexander Chupriyan told reporters at the scene. Two of the victims were members of the hospital's staff. Twelve more people were injured and are in a "serious condition", ITAR-TASS news agency reported, quoting hospital sources. "This is a very serious and unpleasant incident, a tragedy," said Moscow's mayor Yury Luzhkov, who visited the scene, Interfax reported. "It was most likely arson," Luzhkov added. Emergency services were alerted to the fire in drug clinic number 17 in the south of the city at 1:40 am (2240 GMT Friday). The blaze was put out within an hour, Russian news agencies reported. "The fire started in the cafeteria of the old building. By the time firefighters arrived, thick smoke was spreading," Moscow's chief fire inspector Viktor Klimkin was quoted by ITAR-TASS as saying. A total of 177 patients and 15 personnel were in the building in southern Moscow at the time, he said. More than 20 fire engines could be seen at the scene. "Everyone who died in this fire, was dead before the first fire engines arrived. They were at the scene four minutes after the call," Chupriyan said. Churpiyan criticised the actions of the personnel, "because they just monitored the development of the fire, with tragic consequences," he said. Fire crews interviewed on Russian television said many victims could not escape because of metal bars on the windows, while others were overcome by fumes in their sleep. One fireman said an emergency exit was boarded up and the main exit was swathed in smoke. Many victims succumbed to noxious fumes from a plastic coating that covered the walls of the ward, several firemen said. Some survivors smashed windows on upper floors and jumped to the ground, witnesses interviewed at the scene by Russian television said. Klimkin said inspectors had appealed to a court in March for the building to be closed down because of violations of fire safety rules. The court only issued a warning to hospital administrators, ITAR-TASS reported. Prosecutors have opened a criminal inquiry for violation of fire safety laws at the clinic, Moscow's prosecutor Yury Semin said in comments broadcast on state television. Hundreds of drug addicts and alcoholics are treated at the hospital, which is one of three state drug rehab clinics in Moscow and the largest such institution in Russia. The clinic, which was set up in 1982, has around 300 medical specialists. The fire was one of the most serious in Russia in recent years and could prompt a wider review of safety measures across the country, television news reports said. In October, the emergency ministry listed 77 buildings nationwide where serious violations of fire safety laws have been found, including hospitals, theatres and hostels. Investigators were at the scene, with the emergency ministry's fire control department chief Yury Nenashev suggesting that arson was the likeliest cause for the blaze. Nenashev said he was "90 percent" sure it was arson, ITAR-TASS reported. The blaze may prove to be the Russian capital's most lethal in recent history. In 1977, 42 people were killed and over 50 injured in flames that swept the gigantic Rossiya hotel in downtown Moscow. 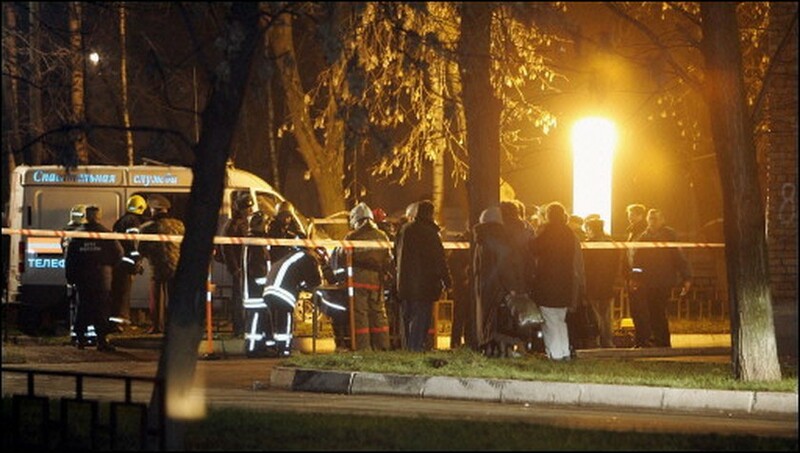 In 2003, a fire in a dormitory of the Friendship of the Peoples university in Moscow killed 38 students.